Last year, I bought a cool wood art piece on clearance from Pier 1. And it sat on the landing, in the hallway, or wherever I moved it, for the next several months. I hate hanging things. And, I'm lazy. 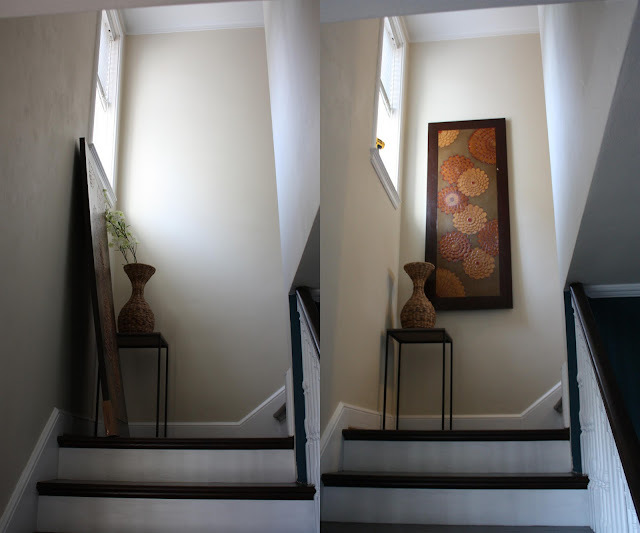 We finally hung it up last week in this blank space at the top of the stairs. For some reason, the person who rang me up told me I needed to attach heavy duty picture hangers to get this thing on the wall. So I bought this. Then, I looked at the back of it, and saw this. Of course there are hangers on the thing, why would they sell it any other way? Pier 1 chick, you are loco. Anywhoooo, we got out the drill and had a couple trials (and errors) before the end result was realized. We used anchors and big screws, so it's not going anywhere. I think it fills up that super tall space really nicely. The only problem is that the bottom is quite bowed from months of standing up against the wall. Boo! Hiss! Oh well, it looks good from the front door. And that will teach me to procrastinate. The end. Love it and it looks so great in that space! Ha! Congrats! It's a big deal when we hang something too because 1. we are procrastinators and 2. our walls are plaster. Ha! Ha! I think that's how I got bowed too...standing against a wall too long!...It's really cute, but I thought you were hanging it horizontally! LOL It took me a minute to look at it in your finished pictures....I like! Looks great! Perfect for that spot, and I love the texture it adds. Oh, and the bow...just extra character my dear!! It looks good! I like it next to the wicker vase thingy. Everything I hang always ends up crooked. We stayed in a beach condo (2009 and 2010) that used that piece of artwork as a headboard in one of the bedrooms. They hung it horizontally over a full-sized bed. I didn't realize that it was a piece of artwork until I saw it on your blog today. I am SO BAD at hanging things on the wall! We have our diplomas hanging in the office and two pictures hanging in our room (there's supposed to be three, but, well...oops). And that's it. I have a ton of frames that *should* be hung, but they're all leaning against walls scattered around the house. Fail. Looks great! And I agree with Anon. Just flip it around and lean it the other way for a few more months to straighten it back out. Very nice! A shame about that bowing though. If it makes you feel any better, we have had a pair of sconces from Z Gallerie leaning in the corner of our bedroom floor for over a year now. I really like them, I just haven't decided where to put them and I am commitment-phobic when it comes to hanging things and putting holes in the walls. Ugh. What an awesome picture. I love the little table too. You are alone! I have a pair of fabric wrapped panels that I need to hang. They were in the basement for about 6 weeks (we moved and that's where they ended up). About a week ago, they made it to the bedroom (their final destination), but they are still sitting on the floor. And I'm sure they will still be there in a month...unless this post inspires me to actually grab a hammer and some nails and hang them this weekend. Such a nice piece. I hardly ever think to go into Pier 1. Your house has such great "nooks and crannies." From this space on the stairs, to the console table area in the front hall, and your red vegetable bin area. Love this! And I am the queen of procrastination right there with you. It is the details that take the longest! I'm the same way about hanging stuff and last week when I got motivated, I was halfway there and the head broke off a screw that was mostly in the wall with a shelf hanging on it, etc. . .you know how that story ends . . .it took a whole other week and trip to the hardware store, blah blah blah. so glad you got your piece hung. it looks great.